When you study manufacturing engineering at St. Cloud State, you'll become a person who plans and builds the production systems for goods that drive the world's economies – everything from computers to automobiles to freezers. You'll use your math and science skills to creatively solve real-life manufacturing problems with tools, production techniques and computers. Working with faculty recognized by industry as experts in their fields, you'll learn to innovate to reduce costs, production times and the use of limited natural resources on products while increasing quality and reliability. 1 of only 23 accredited programs in the United States. New 100,000 sq. ft. state-of-the-art Integrated Science and Engineering Laboratory Facility (ISELF) offers collaborative hands-on work areas for science, technology, engineering, mathematics (STEM) majors for real-world experiences. 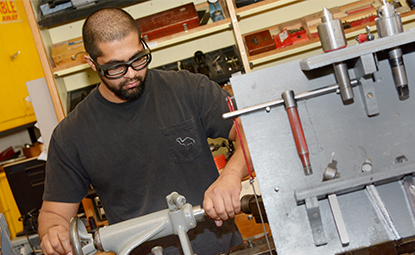 Only manufacturing engineering program in Minnesota accredited by the Engineering Accreditation Commission of ABET, the U.S.'s only accreditation agency for engineering programs. Students and faculty worked with utility Xcel Energy to design and produce a battery-operated foldable electric scooter that engineers and technicians could use to inspect 6- to 7-feet diameter concrete drainage tubes.